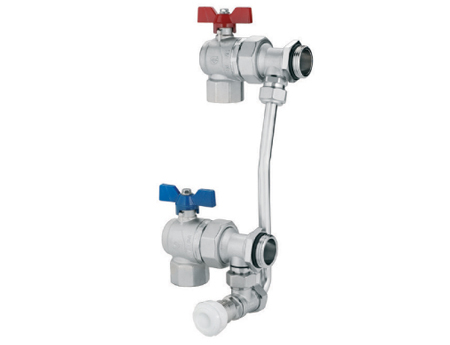 Emmeti have developed a range of differential pressure by-pass valves to suit our manifold range. 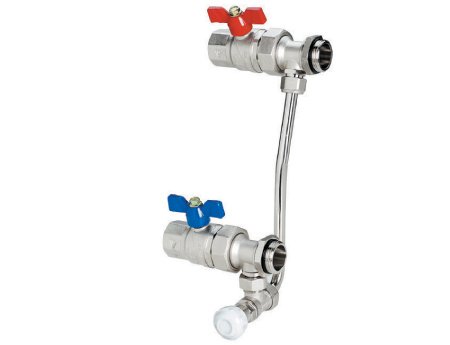 These simple kits can include a pair of ball valves, with red and blue handles for flow and return, the by-pass valve itself, and a chrome plated rigid by-pass pipe. 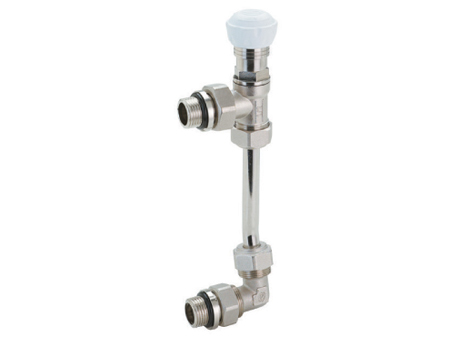 Differential pressure by-pass valve from 0.2 to 0.5 bar. Complies with building regulation Part L requirements. For connection to the left side of a manifold, connecting to flow and return rails. By-passed flow direction is from flow (red handle) to return (blue handle). Do flow meters affect their function? If all your flow meters are set very low, then it will be opening more frequently. You may consider whether you have the correct rated pump for your low flow system. Can I fit on either the flow or return pipework? Fit it to the return pipework. By-pass flow is always from flow to return pipework. Can I fit one of these with a Topway T2 manifold? Yes, it works with either the flow meter or lockshield versions. You can use either 01306160 1” or 01306162 1.1/4” which include the ball valves and rigid by-pass pipe. Or 01306174, 76 with no ball valves. Can I fit one of these to a Floor Mixing Unit? Do you have an option of just the differential by –pass valve? They are provided with detailed instructions. Best practice is to calibrate them using the pump manufacturers flow curves, taking account of what the boiler needs as a minimum return flow.